The Nomadic Museum as seen on February 1. The 45,000-square-foot space opens to the public on March 5. While the city marvels at saffron-bedecked Central Park, another massive arts project has been nearing completion downtown, one shipping container at a time. 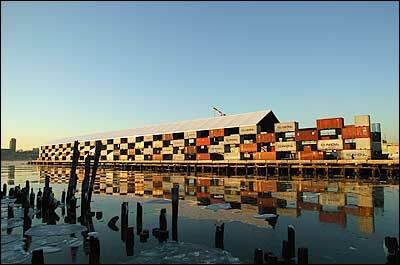 Called the Nomadic Museum, it will take up all of Pier 54, on the Hudson River at 13th Street. But as a museum it’s a rather curious monument: It won’t remain standing for very long. And it’s devoted exclusively to the work of one artist. Photographer Gregory Colbert—who travels the world taking pictures of people communing with whales, elephants, and other animals—got the idea (and funds) for the museum after his one-man installation in 2002 at the Venice Biennale’s Arsenale, a vast shipyard dating from the Renaissance. “Ashes and Snow” was the first solo exhibit ever to occupy the entire space. And every last piece of art in it was bought up by the chairman of Rolex, who then encouraged the artist to use the money to mount the show—as is—in other cities. So, Colbert asked the avant-garde Japanese architect Shigeru Ban to design a museum large enough to travel with it. After “Ashes and Snow” finishes its New York run, from March 5 to June 6, the Nomadic Museum will be taken apart and reassembled in Los Angeles. Future stops include Beijing and Paris. “I was looking for a poetic logic to the building,” Colbert says. “I didn’t want him to make a building he had made.” Known for his clever use of paper and recycled materials, Ban recently designed a Pompidou spinoff in Metz, France. For the Nomadic Museum, 148 empty containers are stacked in a self-supporting grid. Fourteen containers will be used to ship building materials; the remaining ones will be rounded up at the museum’s next port of call. “The idea came from the fact that these can be found in every place the museum will travel to,” says Ban. 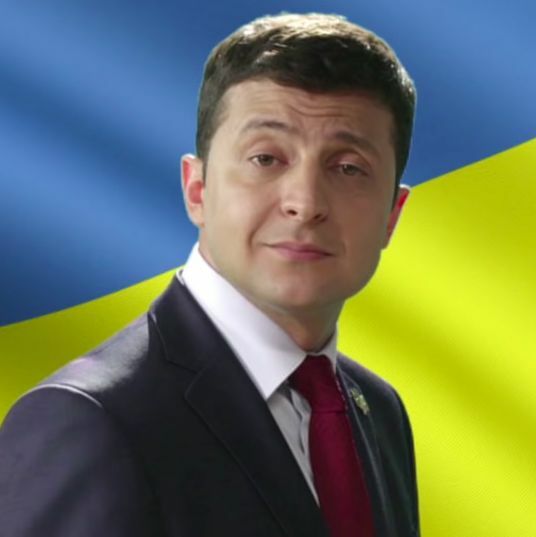 “I have not made anything new. I’m just finding a new function for them.” A tentlike fabric fills in the gaps between the containers and serves as the roof. 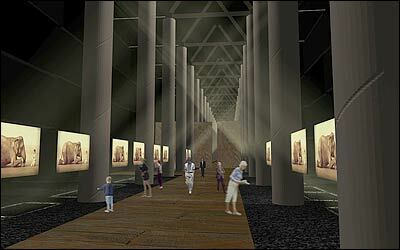 Visitors will enter through the skeletal arch of the old pier, where the Titanic was to have docked. (The museum is renting the pier from the Hudson River Park Trust for $300,000.) Inside will be a large wooden-plank runway, flanked by 6,000 river stones. Colbert’s photographs will float in the air, suspended between giant paper-tube columns that help support the roof. A rendering of the Nomadic Museum. 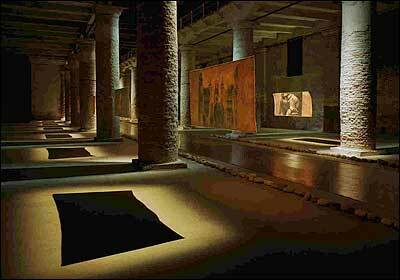 Inspired by Colbert’s Venice Arsenale show, right, the New York interior will have no natural light. The installation is a three-part experience. In addition to 100 images, the show will include a “floating library,” in which pages from an epistolary novel Colbert has written will be projected on screens. At the end is a film—narrated by Laurence Fishburne—showing people dancing with elephants and other cross-species encounters. Admission to the museum: $12. A view toward the city—looking through the remains of the Cunard/White Star Line’s original archway. Its eighteen sections could be lifted into place only when there was no wind (otherwise they’d blow away), explains Dean Maltz, an architect who partnered with Shigeru Ban on the project. So, construction workers put up an American flag near the pier, and when it wasn’t waving, they knew it was safe to proceed. The crane was too heavy to go on the pier, so a barge had to be used. It took two months to build the entire structure. Over thirteen years and 33 expeditions (Burma, India, the waters off Tonga), Colbert has assembled what he calls “a loving exploration into the nature of animals in their natural habitat as they interact with human beings.” The people in his work include Burmese monks, trance dancers, and, of course, Colbert himself.